Maybe it's a funny thing, but most of the time I read about model railroading, it's about getting things done quickly, cheaply and as efficiently as possible. While totally understandable for many obvious reasons, this mindset ends up - unintentionally - considering everything that takes up time to be done to be futile, foolish or simply a bad investment. Being on the creative side, I always hated that mentality that you are an idiot if you take time to do things right and pride yourself in jobs well done. I got it a lot when I was in high school and later in higher education. In my daily professional career, rushing and doing things on the cheap is seen as the tantamount of business practice. Nobody cares about honing skills or mastering an art. The new kid on the block that does half-baked jobs in a wink because he use the latest software is always seen as a saviour... even if under the varnish, very little true craftmanship exist. But to put things in perspective, I'm actually in the process of replicating in 3D one of the most ornate 19th century church steeple in Quebec City. The building itself is a marvel of wood and metal working that makes our modern crap looks like... proverbial crap. As expected, I was asked to do the thing as fast as lightning, but this time, I decided to do the job right and take the extra step required to go as far as replicating acanthus leaves on Corinthian capitols. The result is interesting in two ways. First, it proves it can be done rather easily when someone takes the job seriously, but first and foremost, it was the first time in 10 years I was proud of my job and what I did. For once, I created beauty. It required - virtually - to carve and craft elements with care, using all my knowledge of geometry to retrieve the formulas used to design the structure back in 1867. It was both motivating and rewarding! 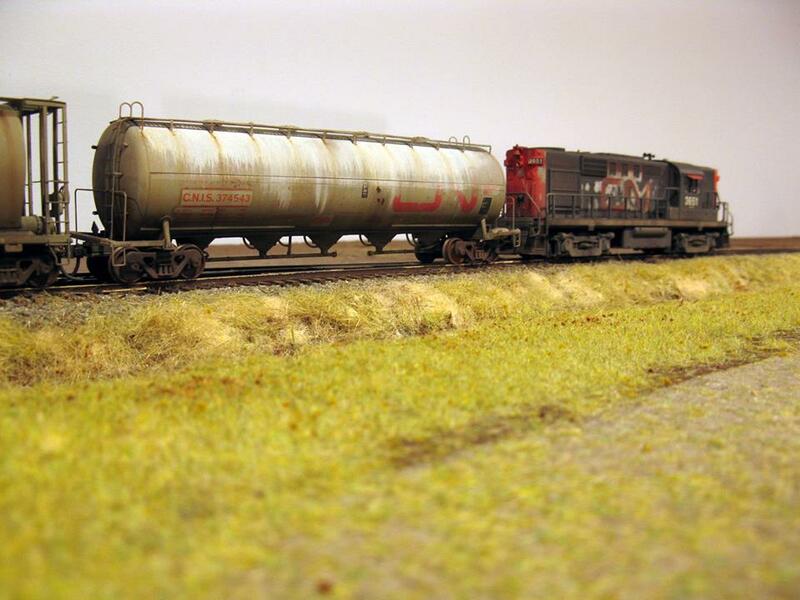 The funny thing is I also applied the same work ethic to my freight car fleet. Recently, while programming the Harlem Station layout into JMRI, I found out I lacked car and needed to have a larger fleet. 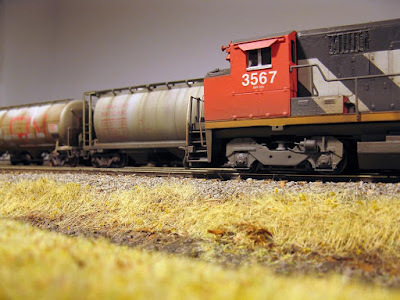 I had many options: setting on cheap stand in models, buy expensive but correct RTR models, buy kits (Intermountain, Westerfield, Tichy, Rapido, etc.) or simply see what could be done with old cars in my stash. As expected, I opted for the three last options. 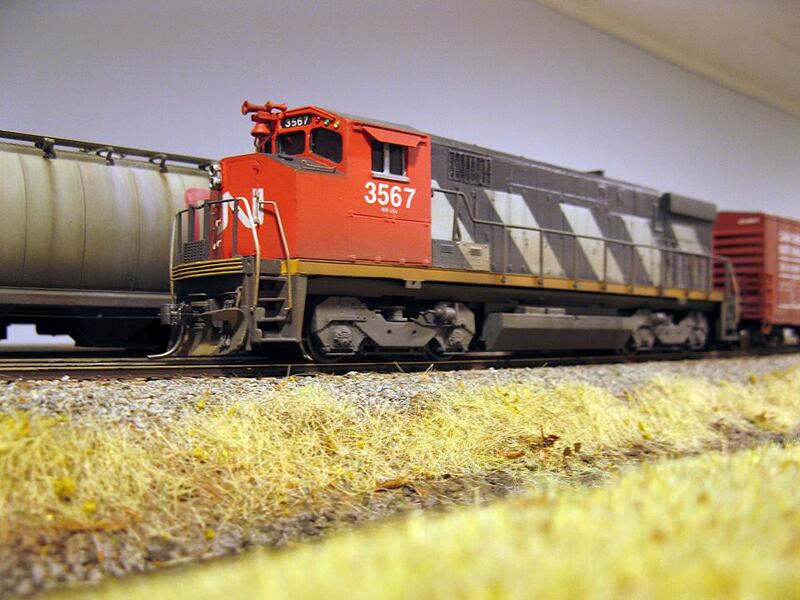 I had two Life-Like/Varney wood reefers and four Athearn steel ice reefers. Both models would hardly be considered as quality products, but I decided to check out their original prototype. 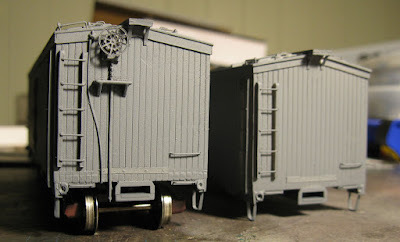 It seems the Life-Like prototype was based on a generic 37 meat reefer design still in service in the 1950s. After doing some research, I found out it was really close to the GARX prototypes. Thus, using old drawings and pictures, and also Rapido's pictures of their own model, I decided to update the "el cheapo" models. My goal was clear, make sure the rebuilt cars would looks great when compared to higher end models. 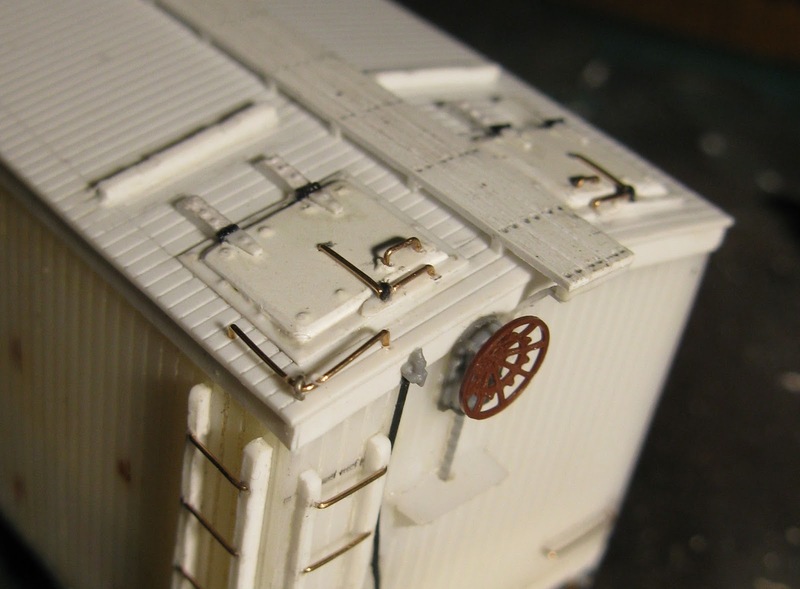 It meant I had to remove almost every details including roofs, doors, brakes, underframe, etc. and craft everything by myself. The process took several dozen of hours over a few weeks. It could have been tedious, but each evening I set myself in completing one small task while listening my favourite podcasts and channels. The result was that I spent quality time doing fun modelling projects and got great cars for little money. Once primed, most people would hardly believed it was a pair of trainset cars. 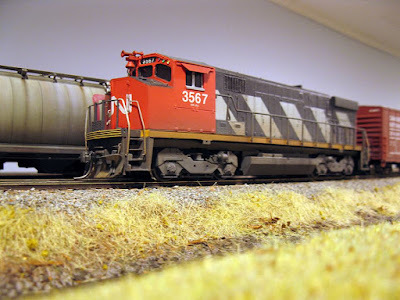 This success brought me to strip the paint out of four Athearn reefer and bash them into their intended original prototype: the ubiquitous PFE R-40-23 steel reefer. 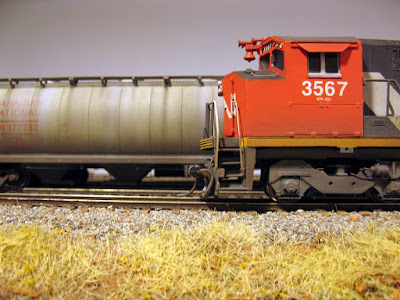 As a matter of fact, I ordered two Intermountain kits and various spare parts with the intention of drastically improving the Athearn cars into worthy models. And once again, many hours are spend upgrading them with small hand crafted parts. Each detail is a challenge requiring to understand how the parts work in real life and trying to replicate them in scale. If the task seems complex, I simply do it step by step so I can feel I'm progressing each day instead of facing a wall. I don't know how much time it will take, probably well over 60 hours... but it's not a problem but rather a blessing. In our increasingly cynical world, taking time to carefully craft beautiful things can be seen as a luxury, but also as a proof we still have the freedom to do good things. Applying static grass has become a leitmotiv recently. It's probably the reason why my posting rate dropped. Hard to bring up new topic when all you do is the same old stuff again and again. 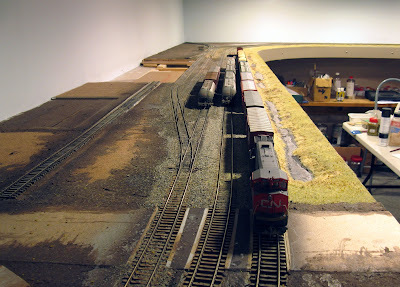 Yet, as boring as it may sound, this crucial step brings life to the layout as never before. g. But thinking about it now. I'm not so sure it was a great idea. This is one of these case when you must take a break, sit back and relax before you can better assess the result. Don't get me wrong, the new road looks nice. However, it seems it lacks punch. And to be honest, while I criticized my previous concept as a little bit far fetched, I must say the new one share the same flaw. So don't be surprised if I revert back to simply doing D'Estimauville Avenue. I can already hear Jérôme laughing in my back and saying "I told you!" Oh well... I'll never learn the lesson, I shoudl trust him more. On a more positive way, Jérôme operated the layout from Clermont to Québec instead of Québec to Clermont as Chemin de fer Charlevoix used to do. He found out interesting stuff. 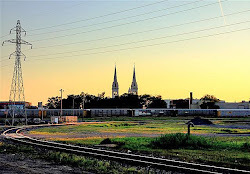 First, the actual trackage in Clermont is quite enough to handle the traffic. It seems the siding is less prone to be filled up when operating that way. 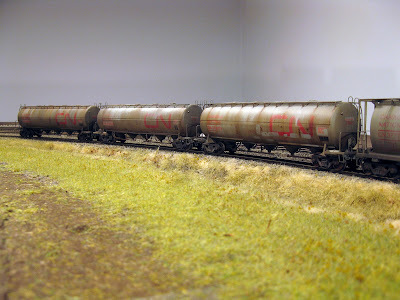 Also, we ordered a few Walthers CN insulated boxcars for the cement plant. 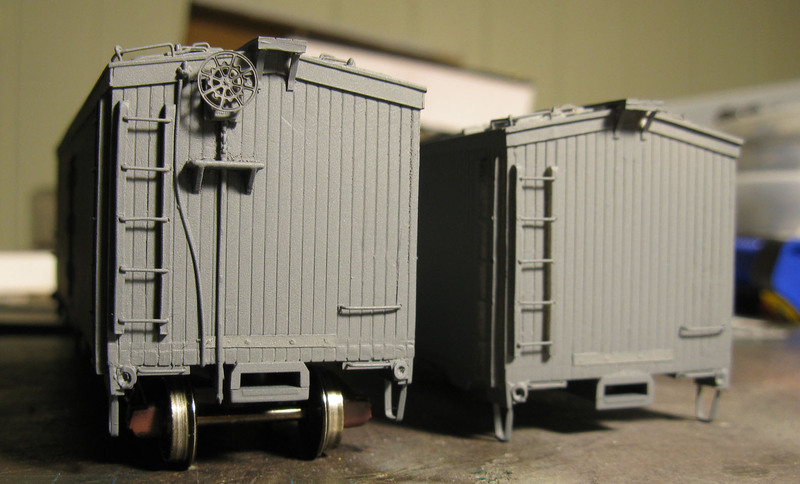 They aren't 100% accurate but sufficiently to be better than my Bachmann kitbashes. However, that doesn't mean I won't improve the details a little bit more. 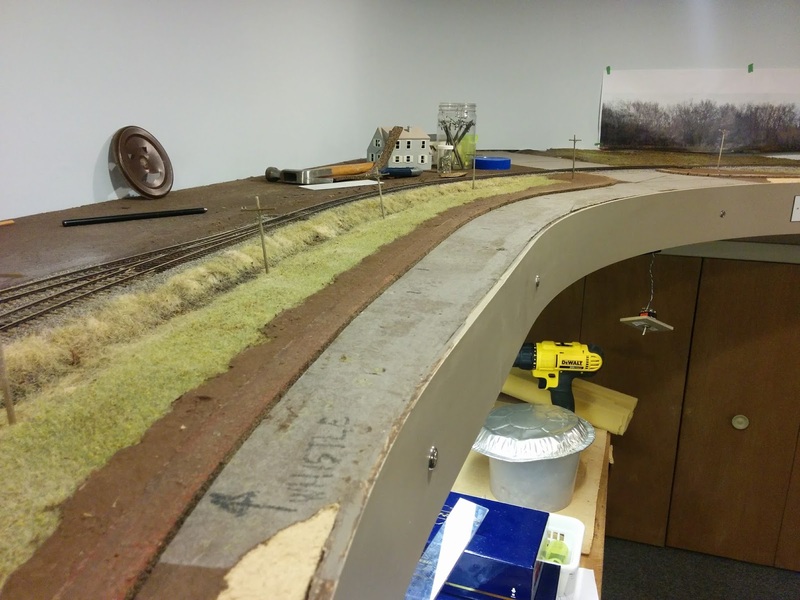 We also ordered a few more bulkhead flatcar to better handle the lumber traffic that was typical on Murray Bay. It also means a lot of cars will soon be obsolete and I'm thinking about selling a few of them later. 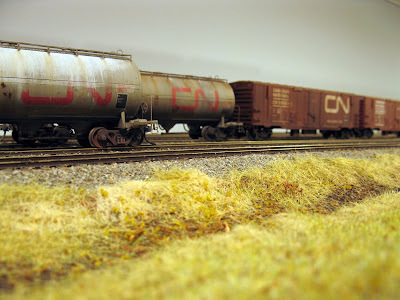 One of the most obvious joy of adding scenery is to be able to photograph your models in context. 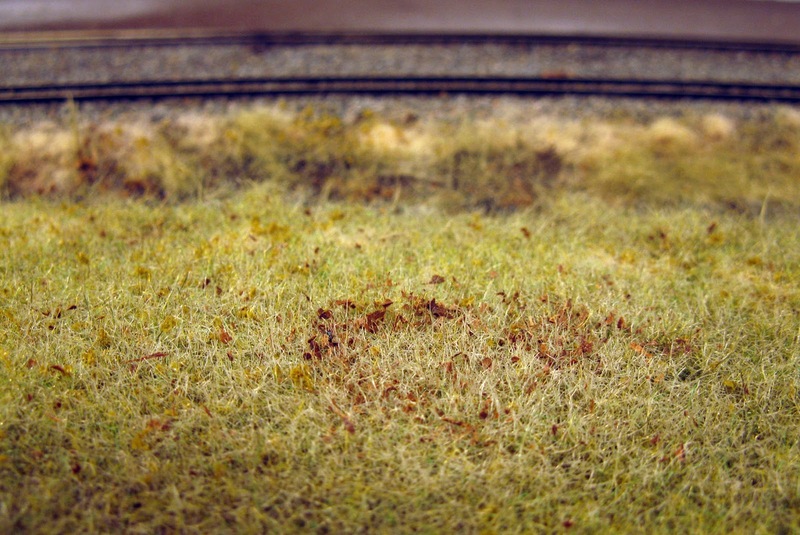 As great a model and it's weathering can be, poor photographing condition will always results in poor results. I recently took advantage of scenic improvement in Villeneuve to shoot a few set of picture of my highly speculative M420 kitbash. It is also a good way to analyse my work on grass and see what can be improved and what worked. 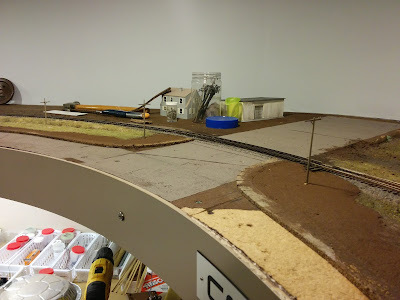 This is probably one of the best motivational factor in continuing working on the layout. 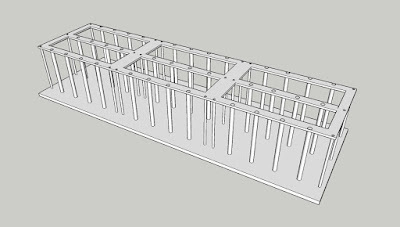 I finally settled down on a structural design for the cement plant model. My key objectives were strong structure, accessibility to add details over time and as much as possible, a decent level of prototypicalness. 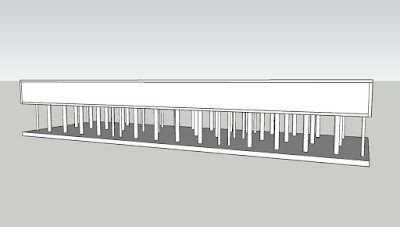 I certainly could build the actual structure as it was with beams and columns. 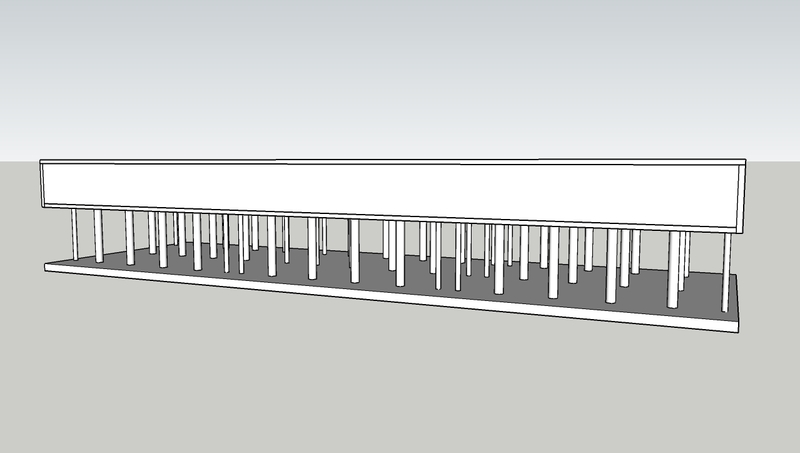 However, since it would be made out of several different parts, I fear alignment problems. A base and a top board seems to me a better way to ensure a certain level of squareness. 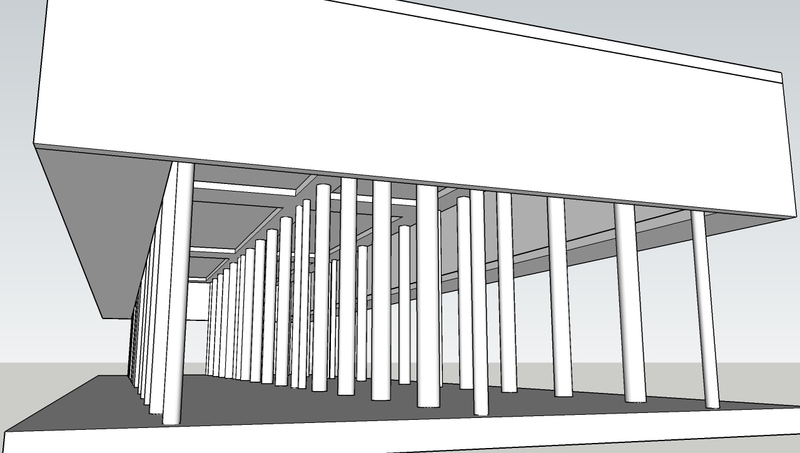 It also gives some room in case of slight variation on column height. And finally, both board can be drilled at the same time, clamped together for maximum accuracy. It must be noted I'll probably need to brace the building in some way. 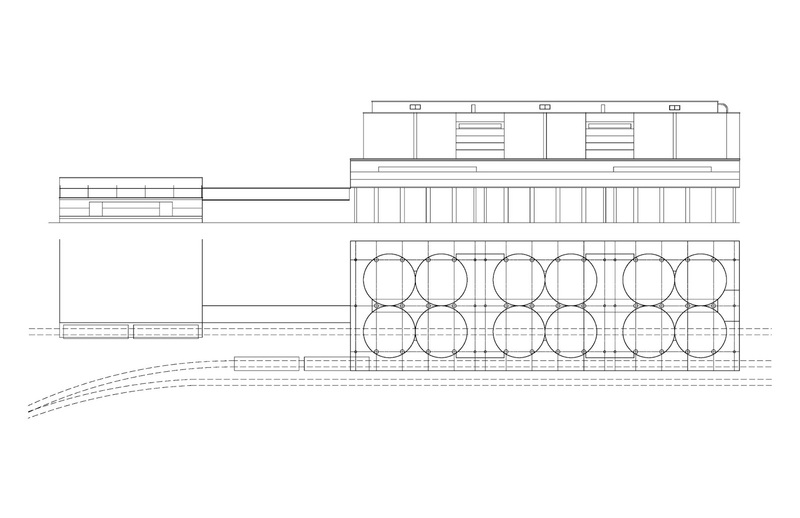 Under each group of silos existed a central core that housed equipment. 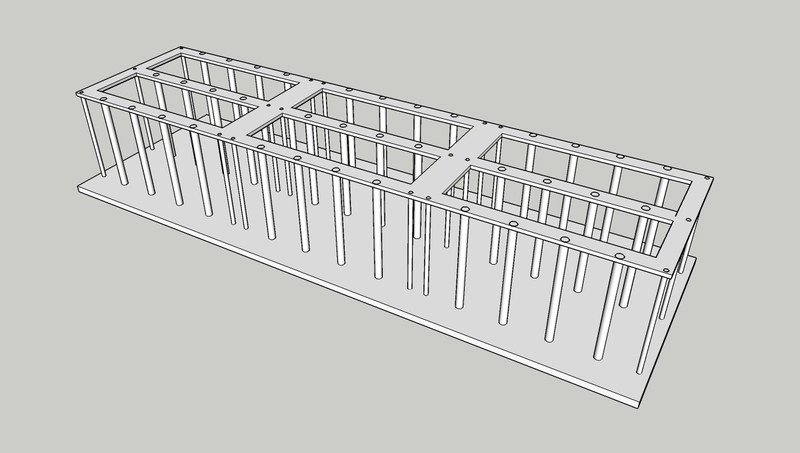 I'll probably use them to make sure the structure is braced sufficently. The weight of the ABS silos and the upper storey shouldn't be underestimated. Huge structures are always something I fear… and for a good reason. Their sheer size means they have to be structurally strong enough to support themselves and not sag. 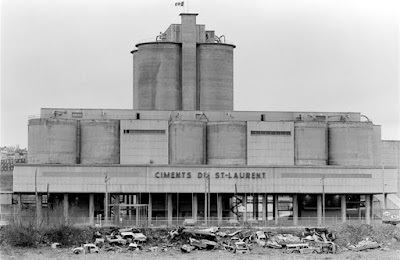 For building like Ciment St-Laurent, it can quickly become a nightmare since the silos are supported by concrete columns. Add to that, conveyors, walkways and various equipment, all nested under the silos and visible under normal operating conditions, and you get the recipe for quite a headache. 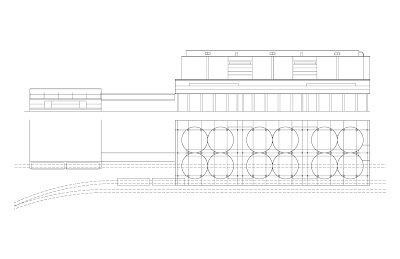 The proof, I’ve drawing and redrawing this building for years now and was never satisfied. Fortunately, a fellow modeller from Montmorency sent me a set of pictures taken in the mid-1970s. One of them was an almost perfectly framed photo of the main elevation. This picture helped me to finally understand how the engineers designed the structure back in the fifties. 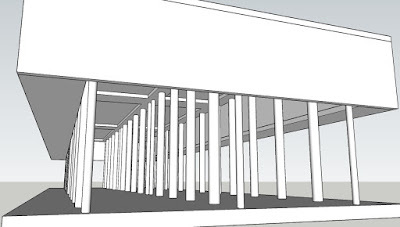 Finally, the beams and columns started to align perfectly with the silos they were supporting and the track alignment made sense. I must admit nothing is more rewarding than contemplating a well-crafted set of plans and I certainly want to tip my hat to the men that built this cement plant. As mundane the subject was, the great care to optimize the various components gave rise to an emblematic plant that had genuine architectural merit. Most cement plants are ugly ducklings; nothing more than materialized industrial process. 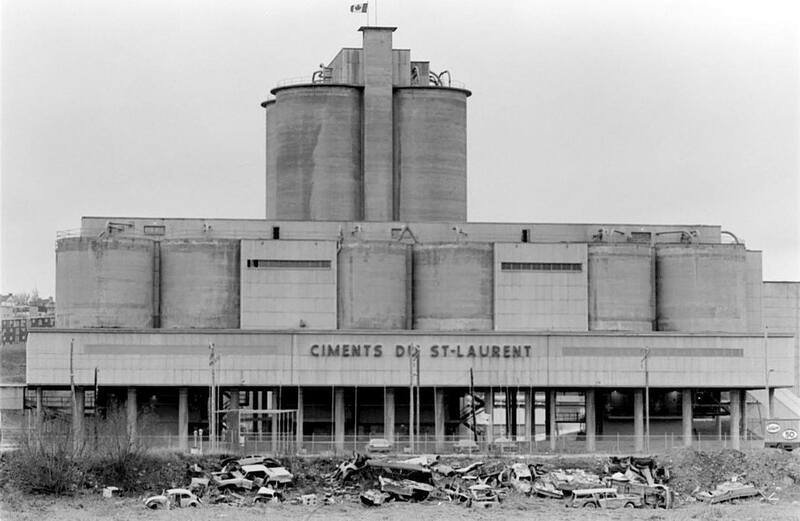 But I’m pretty convinced Ciment St-Laurent wanted its production site, located on one of the major road of the time before the highway boom of the 1960s, to be a flagship. And they did succeed. For proof, I recall a set of professional pictures shot in the mid-1950s showing the cement plant under extremely artistic angles. It was beautiful and could have made any photograph exhibits in town. Unfortunately, that a big part of corporate pride no longer exist and it’s why I want to be sure my model will live up to the prototype. 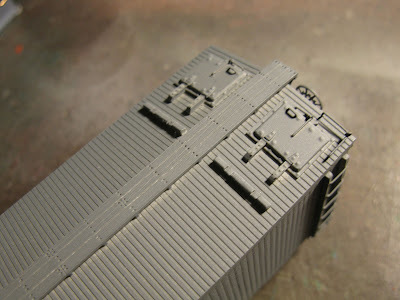 I certainly wish to quickly find out a way to build this model in an efficient way. Another session of grass application in Villeneuve went by last Thursday evening. 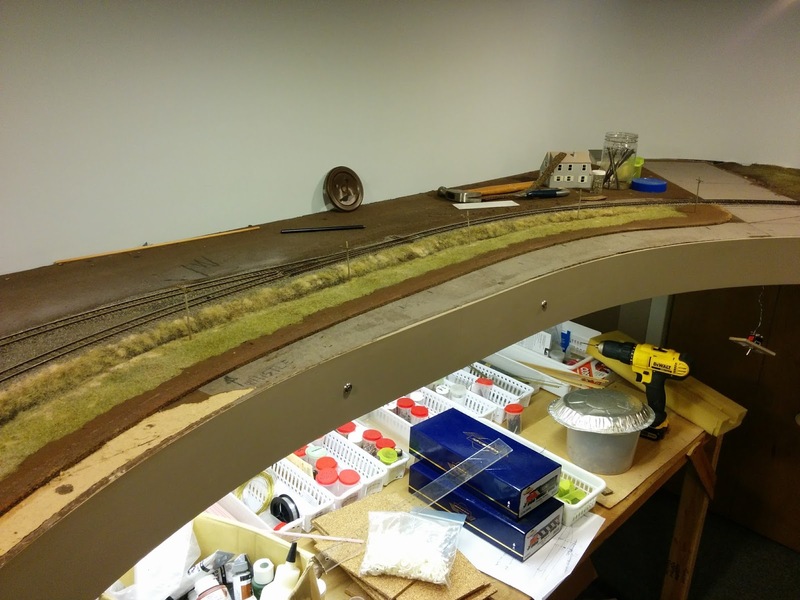 The last stretch of ditches was completed up to D’Estimauville Avenue, helping to unify the vista all over the room. 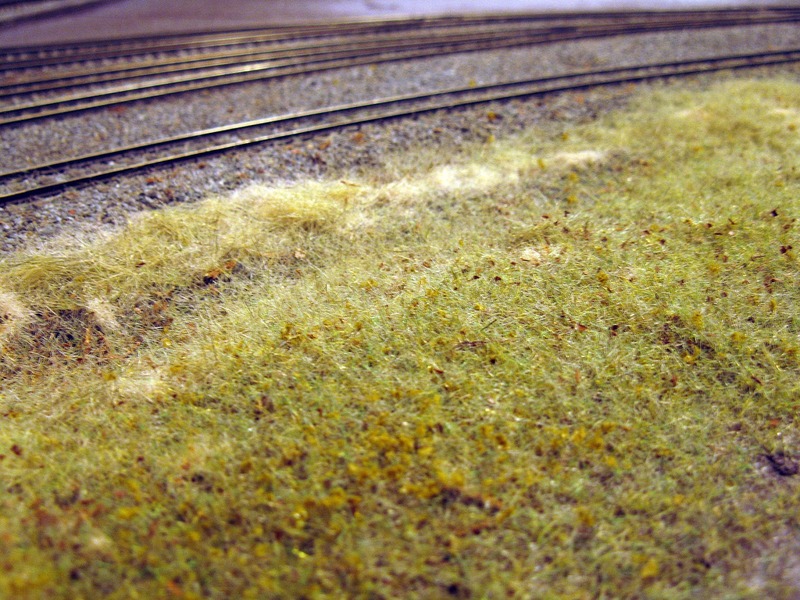 I also experimented with short and well-groom grass on flat areas. In the past, my attempts were clumsy and too contrasted to look credible. 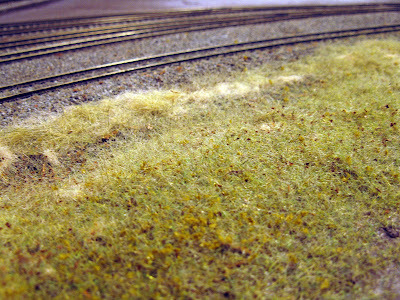 Yellow dead grass was applied right beside green one. This time, to get a more toned down look, I randomly mixed for grass colors together in the grass applicator. To make sure the grass would be randomized, I didn’t bother blending the color to much in the grass applicator. Also, instead of applying grass in one pass, I did it in three passes. I also made sure to add ground foam and leaves here and there to give relief and variability in grass height. When color was too uniform or blended badly with the ditches, another specific pass was done on relevant spot. This randomness, a key feature of nature, ensured the very long stretch of grass wouldn’t look like a grass carpet. Later, small weeds, bushes and trees will be sparingly added to the scene for some extra variation. Looking back at my first experiments with grass in Clermont make them pale in comparison. I’ll certainly have to redo many parts here and there. I also want to change the overall scene transition a little bit in Villeneuve as progress is made. Among the changes, I rescinded the parking lot in d’Estimauville, finding it a little bit a gimmick. I’m also seriously thinking about merging Maizerets into Villeneuve as a large and flowing scene. I’m not that much a fan of staging a train that reaches its destination while the caboose in still in stating. I’m not sure how I’ll do it, but with Jérôme, we have started to analyze some spots along the line in Villeneuve that could be suitable. Interestingly, a set of bridge similar to the one in Maizeret does exist not far from the cement plant. 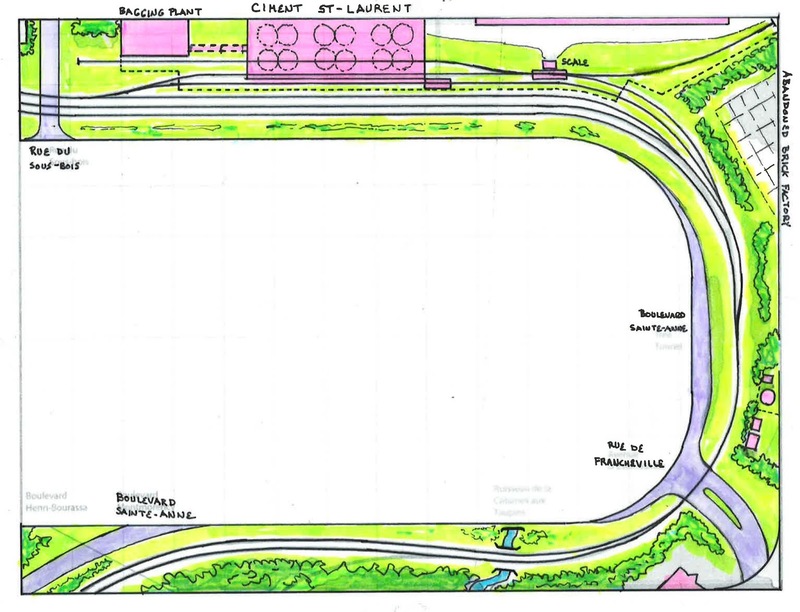 Also, I’d like to bring back a feature of my original design: a road parallel to the track just like the prototypical Boulevard Sainte-Anne that follow the line for at least 20 miles. Failing to show this feature seems to be missing a key element of Murray Bay Sudvision. 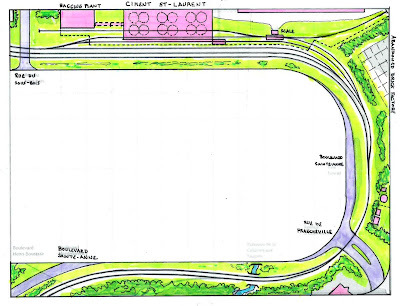 If it wasn’t a matter of access, that road would have been modelled in front of the cement plant too. To be blunt, I’m getting sick of vignettes, cameos and other forced theatrical devices in layout planning. I’m not against any of them when they are used with parsimony, to bring life or to better capture the sense of a prototype. However, constantly including references and “clins d’oeil” ends up like a botched Hollywood movie in which every trick of the trade must be put on film as if it was shouting “hey, it’s ME!!! !”… Murray Bay Subdivision is too much a simple place to start adding more stuff around. At some point, you break the suspension of disbelief. And mark my words, I’m starting to think the diesel era modelling has far less room in that regard. Steam era infrastructure was extent and everywhere. Every mile, every location, had its bunch of stuff laying around. However, in modern time, railway infrastructure had been greatly streamlined and reduced while trains got longer. 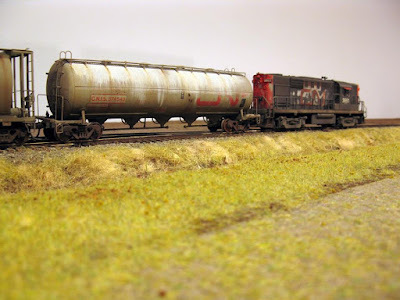 If you continue to add stuff mindlessly, you quickly depart from that feeling of vast and somewhat empty space, particularly for main lines and branch lines. So, bottom of the barrel, since our layout is nothing more than a magnified shelf switching layout, I'm starting to think each room should be treated as one large location instead of a collection of loosely tied together scenes. Most people will scream "Oh no!" but personally, it makes more sense and I feel I'm not trying to cheat myself with nonsensical geography.